Perhaps...or maybe they just ran inside to find out where to park. Usually if trying to avoid paying for parking, you wouldn’t leave it right out in the open. That’s right outside the main GBC entrance IIRC. To the duck-walking shoulder rider on the DVP @ 10AM this morning. 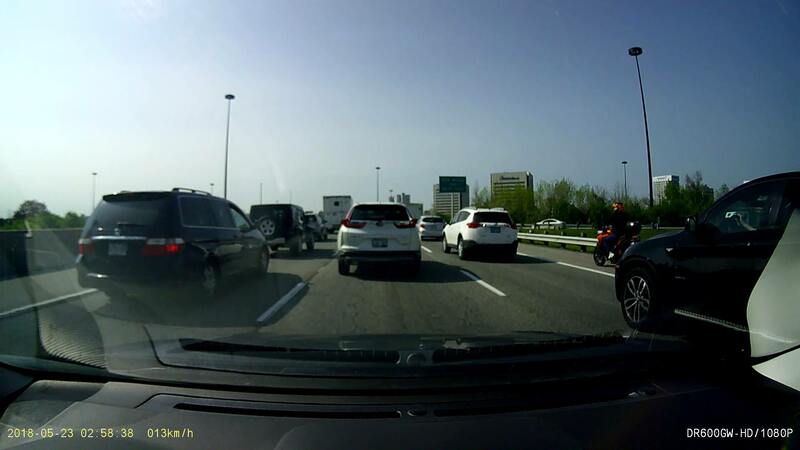 If you're going to ride the shoulder or attempt to filter through traffic, please at least indicate your intentions and commit to what you decide on doing. While following traffic you were in my sights for about 10 mins and I ended up passing you following traffic while you almost got rear ended twice by making lane changes into live lanes with cars travelling much faster than you without speeding up or indicating. Re: I Saw You, Are you on this forum? V.2.0. 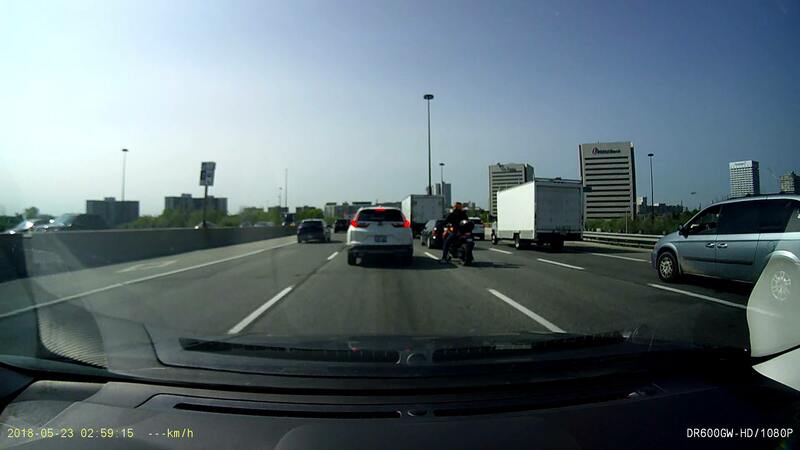 Rider with a hi-viz helmet on a scrambler/cafe racer, every morning northbound on the 404 around 7-8. I see you every day haha. What kind of bike is that? A fellow V30 rider on the 404 northbound today around 4:30pm. Nice ride! V-Strom rider 401 West around 4:45 near Airport. Keep lane splitting at 130 between trucks. That will turn out just fine. I passed you and kept ahead of you doing legal lane changes. I thought you turned down the 403 when suddenly you turned up beside me in stop and go traffic. You obviously lane split to catch up to me. You should have kept on lane splitting past me, because I really really don't want your kind riding beside me in my lane. I don't know you, I don't want to get to know you. Don't share a lane with strangers. I don't trust you. "Life is a dream, realize it." Mother Teresa. Yeah... Just saw an R3 today splitting up the DVP this afternoon and almost side swiped and possibly run over because she grabbed a fist full of brakes when seeing a cop a few cars up and almost lost it while veering in front of the van while traffic was coming to a stop. I mean, I'm for filtering through slowly moving or stopped traffic, but the 40km/h+ speed differential and coming to an abrupt stop in front of a car that didn't know you were there a second ago is a recipe for disaster. Looked like a relatively new rider too, given very choppy throttle and often in the wrong gear. Hey Mr Ducati man who cut me off on the 427 and zenway about 20 mins ago and then gave me a finger and pulled a uey. I'm forever wondering if you would ever do that without a helmet on would love to see it. Who else was at the 12 pm demo ride for Yamaha today at vos? Crap dude I totally forgot about it! Got there just after 12, hung out until 3. Current gen GSX-R 1000 on Highway 7. No visible mods, even had reflectors. Responsible rider in full gear. Nah, the only bigger sport bike then mine is the MT10 and i wasn't too interested. R3s are great, i had one before! I was both surprised and not surprised that the r6 or r1 wasn't there this year. Wonder what happened. Probably too many donks being full retard on them. Got those cargo pants from GP (kevlar lined with D3O in hips and knee's) - great in hot weather but you can feel engine heat when stationery against lower legs unless you wear full size boots. Also saw two motorcycle cops tucked in on Bayview north just inside on the Lawrence turn off, very sneaky! They are always camping that bridge, cruiser usually watching southbound before you go under for that sweeping left. I saw a bike similar to mine the other day out Hamilton way. This is 06, mine is a 12.